A new group show at Page Bond Gallery offers wide view of talent | Arts and Culture | Style Weekly - Richmond, VA local news, arts, and events. Ask an artist about the benefits of being in a group show and you'll likely encounter a lot of enthusiasm. Given their range, group shows bring in a diverse crowd of interested viewers, so they can be a good way to attract new attention. Artists often find that having so much combined creative energy in the gallery at one time to be inspirational and thought-provoking. "Gather," a group exhibition of works at Page Bond Gallery by established and emerging artists from Virginia and elsewhere surveys an array of art practices including glass, painting, photo-based works, sculpture and works on paper. According to gallery owner Bond, the exhibition title is multifaceted. "One, this is the time of year when we spend time gathering together, whether with family or friends. Two, group exhibitions are a gathering of talent and three, gathering different artists together creates a visual experience for collectors, creating a kind of mash up, which is great for both artists, collectors and for me as the curator." Virginia Commonwealth University graduate Roberto Jamora paints primarily with oil and adds beeswax as a way to transfer aspects of a memory onto canvas. "One Paradise to Another" is inspired by the colors of the landscape of Puerto Vallarta and New Orleans. While an artist-in-residence at the Joan Mitchell Center in New Orleans last fall, Jamora made a quick trip to Puerto Vallarta for a wedding. "The green, for me, alludes to the bold color that homes in New Orleans are often painted," he explains. "This painting is a kind of celebration of color from these specific places and events in my life." Sayaka Suzuki came to Richmond for graduate school in 2003 and stayed on as faculty at VCU. After being part of two studio collectives, she built a studio at her home in Richmond's East End. Exploring Japanese textiles and motifs in her work was a way of examining her origins and the idea of being an immigrant. "Sashiko Cranes" was created using acrylic, cotton thread, wallboard and wood, first painting and then embroidering the drywall. "Embroidery through Sheetrock is rather a physical and violent act, stabbing and pulling," Suzuki says. "But ultimately it creates a soft imagery of things and ideas that I want to preserve and nurture." 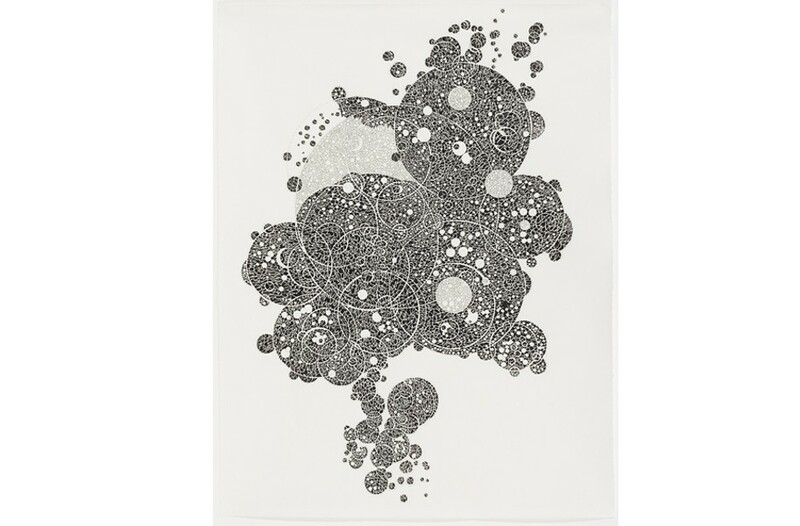 An adjunct professor of sculpture at University of Richmond, Fiona Ross uses a nib pen and sumi ink on paper to create her intricate drawings. Repeated applications of the ink cause it to become glossy and also make the paper pucker and ripple, adding elements of raised relief topographic maps to the artworks. "Fractal Eclipse #21" was inspired by the eclipse and celestial globes, spheres and ring dials. Her intent was to capture some of the wonder she felt seeing tiny, fractured crescents of the sun on the ground in the shadows of the fluttering leaves of the trees, the unusual color of the atmosphere and the arcing path of the moon as it passed between the sun and the Earth. "The fractals shapes I use stand for the constant state of change caused by geological forces," she says. "It also symbolizes how our imperfect knowledge is accumulated in fragments." A Virginian since fourth grade, S. Ross Brown seeks to give a visual context for self-actualization and self-determination as it pertains to historically marginalized Americans, while also giving aesthetic credence to the notion of kinetic spirit. Of "The Spirit of Her Familiar," he explains, "I find my inspiration in my observations of life itself, especially as it pertains to the indomitable spirit of the people of the diaspora." Brown sees group shows as a means of unifying cultures, ethnicity and creative outlooks in conjunction with a high level of artistic virtuosity and professionalism. Everyone agrees that the advantage of a group exhibition is that it allows for thinking more broadly about talent. "Page Bond's group shows are extremely supportive of local artists and the often unconventional ways in which artists like to work," Suzuki says. "It's always beneficial to be exhibited in this manner alongside artists who are challenging and pushing new ideas and ways of working." "Gather" opens Dec. 14 at 6 p.m. and runs through Jan. 7 at Page Bond Gallery, 1625 W. Main St. pagebondgallery.com.